A member of Germany’s foreign intelligence agency has been detained for possibly spying for the US. The 31-year-old is suspected of giving a US spy agency information about a parliamentary inquiry of NSA activities. (Image: PictureAlliance/DPA))German news outlets on Friday are reporting that a so-called “double agent” has been detained after confessing to investigators that he was paid by U.S. agents to spy on the German parliamentary panel now investigating the extent of U.S. National Security Agency’s surveillance inside the country. During questioning, the suspect reportedly told investigators that he had gathered information on an investigative committee from Germany’s lower house of parliament, the Bundestag. 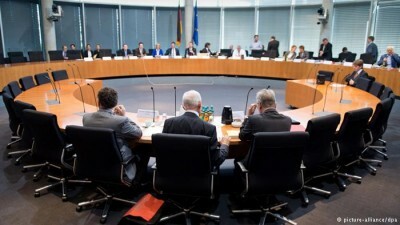 The panel is conducting an inquiry into NSA surveillance on German officials and citizens. A spokesperson for the Federal Prosecutor’s office declined to provide further details about the case, according to news agency AFP. German-US relations have been on the rocks since revelations of mass surveillance not only on German citizens, but also on Chancellor Angela Merkel and other politicians made headlines last year. The 31-year-old was originally arrested on suspicion of having contact with Russian intelligence, but then apparently confessed to having reported back at least once to the Americans on the Bundestag committee’s activities. He reportedly did this for money. The reports raise the possibility that he may be lying, but also note that the committee has long suspected it was being spied on. If this is all true, it may turn out to be an even bigger diplomatic scandal than the NSA’s bugging of Chancellor Angela Merkel’s phone, a formal probe into which was announced a month ago. Drake said the BND had become a “vermiform appendix of the NSA,” referring to accusations it had been passing data on German citizens on to the American service – an act forbidden under Germany’s constitution.